Shut Up & Rock On conducted an interview with Eddie and touched on topics such as his career, the future of That Metal Show and the Rock N’ Roll Hall of Fame. Highlights from Q&A appear below. Shut Up & Rock On: What first made you want to pursue music as a career? 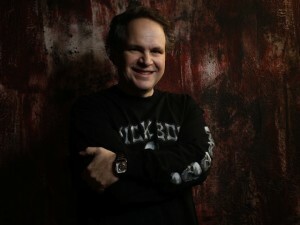 Eddie Trunk: Well, for me it was all about how can I share music that I love with other people. That’s all that mattered to me, it wasn’t about trying to become well known or anything. It was how can I take the music I love- that I thought was being very under appreciated- and get it exposed to more people. So when I was in high school I started writing stories in my high school newspaper, working in a record store, working for a management company, working for a record company and started in radio all in my first couple years out of high school. And basically, it was just all these things that I could do, all these different avenues that I could take the music I cared about and deliver it to other people and tell them that it existed…it’s still about anything I can do to sell and push the music, but I also have to keep in mind that yes I also make a living…and support a family, so I have to make sure that I’m also working as well. But that was the number one driver from the beginning…to elevate the bar, give this music the respect it deserves and maybe get away from some of the clichés that come with it too- that always kind of bothered me. I think there’s a lot more people into this music than people would know, but because they think they can figure it out just by how you look, it’s not really the truth so I was trying to break down some of those walls. Shut Up & Rock On: Now you went to college, but you didn’t graduate right? Eddie Trunk: I barely went to college. Shut Up & Rock On: Did you go for music or something else? No I didn’t go to college for anything. I went to a community college by my house and I lasted about two months, and I got a job working at a record store which at the time was like my dream job and so I was like ‘that’s it!,’ back then record stores were really something. I just decided that. I was never really good in school, and it wasn’t that I wasn’t smart, it was because unless it was something that interests me I didn’t apply myself at all. So what happened was I got the job that I always wanted, working in a record store, and I wasn’t really into going to college and I started to get into radio [a] little bit and then my parents we’re like ‘we don’t want to waste money if you’re not really gonna get into it.’ So, they said if you’re gonna go and really apply yourself then we’ll help you how ever we can, but when they saw that I was really only half into it I think that’s when they realized, you know, at that point I’m just going to kind of go on my own path. And I have to be careful when I say that because I don’t say that to discourage anyone from going to college, I just say that because for me it…it wasn’t something I really wanted to pursue. I didn’t feel that what I wanted to ultimately do for a living you could learn in school- which you can’t. You have to do it through experience. Shut Up & Rock On: When you were younger, like back then, did you ever think you would end up, career wise, where you are right now? Eddie Trunk: I thought I would just be a big music fan, that I would always love music and support music and be around it as much as I could. Go to as many shows as I could and be involved in it where I could. I figured maybe it will be a part time job when I got into radio- like I said to myself ‘okay, well maybe I’ll be able to do radio on the weekends and have my full time job, whatever that ends up being, during the week’. But I never really thought of the music being my sole career until my radio show moved from New Jersey into New York City, and that was in ‘94. And then that was when things opened up a lot more, that’s when I started to get a lot more interest and reach to a lot more people and started making better money. Then when that happened I said ‘okay maybe I’m going to just stay with music, maybe I’m actually going to make a career just doing this music thing’. And that’s fortunately how it’s been ever since. Very different things, you know, my world is very up and down as far as money, there’s not traditional hours, there’s nothing traditional about it. But I’m an independent contractor on everything that I do, but at the same token you know, if you are good with managing yourself and managing money and everything it’s okay. So I found a way to make it work, but I am very lucky to have taken my passion and made it my career. Shut Up & Rock On: What made you want to start a podcast? Eddie Trunk: I had resisted doing a podcast for a long time. The reason why is because I said ‘well I already have two radio shows a week what am I going to go on a podcast? How is it going to be different?’ I also was concerned that if I’m going to interview somebody, do I need to do the interview 3 times now for the same thing? It would be redundant. But a company came to me about a year and a half ago called PodcastOne…and they told me that they really don’t care what I do as long as you give us new content one time a week, I said okay I’ll give it a shot. So I started it, I guess it’s about a little over a year and half ago and it’s done tremendously well. I mean it’s amazing how many people listen to it and download it and I hear from people all over the world and it’s really cool. You know I can’t play music on the podcast because of publishing issue- but it’s cool how just hearing me talk about something or recommend something is enough to get someone to go out and buy it. Shut Up & Rock On: I assume you still don’t know that much about what’s happening with That Metal Show. In the case that it doesn’t get renewed, what do you think you’ll be doing? Eddie Trunk: We’re hoping to know what the future of the show is in the next month or so and we’re certainly hoping that we continue with VH1 classic or we find a new home for it. When we know that we’ll go to the next step but you know, nothing lasts forever and one day the show will go away. And if it’s now or in five years we don’t know…but when the day comes that the show does end- and I told everybody the same thing. I’ve been working in the music industry for twenty five years before That Metal Show even existed, nothing’s gonna change for me, I’m gonna keep doing what I always do. Keep doing my radio shows, keep doing my podcast and keep looking for new opportunities in TV or radio or whatever. So, nothing will change I’ll just keep fighting the fight and seeing where it takes me. It’s all I can do. Shut Up & Rock On: How do you feel now that you’ve gotten to vote for the Rock and Roll Hall of Fame? Eddie Trunk: Well, they are well aware of me screaming about them for a long time. And I think that, um, my take is that they really are starting to want to make some changes. I really do want to try to make it better and they’ve shown some signs of doing that. And there’s a bunch of people that are on the inside and part of the committee there and everything that had been pushing them for a long time to bring me on as a voting member. So, the last guy to actually really push and put my name in was Tom Morello and I got a call from the Rock and Roll Hall of Fame’s office just before this voting panel and they said ‘we were referred to you by Tom Morello and we would like to see if you would like to be a voter’. But, you know I thought about it for a second and really for me yelling and screaming about the Rock and Roll Hall of Fame, it would have been pretty idiotic for me to turn it down because here’s the opportunity for me to actually help make a change and I’m saying no? That would be just dumb, so I thought about it for a second and I said ‘yeah, sure!’ Just to be clear on it, I don’t pick who is eligible, I pick from the list they make of eligible artists- the eleven or twelve people each year- and I vote from there. So, this was the first year I got to vote and three of the five people I voted for made it, so that’s a pretty good ratio. I wish I could pick the football games that well. Read more at Shut Up & Rock On. eddie, can you make a change for $100? Now Eddie’s gonna turn into an elitist snob just like Stern did. Having listened to Eddie since 1984, I think your prediction will turn out to be incredibly WRONG. From back in the days when Eddie was doing 7 minutes of Metal News once a week on WDHA, the guy’s love for and attitude towards Hard Rock/Heavy Metal has not changed one bit. His venues may have changed and he’s obviously more famous now, but the guy has been incredibly authentic and consistent throughout (sometimes to the point of annoying me – like, with regards to KISS). Fact is, everyone progresses. The problem is when you don’t progress – then you’re obsolete. KISS doesn’t play with Ace/Peter. Stern doesn’t do “Lesbian Dial-a-Date” every other day. Eddie is a member of the RRHoF committee. It’s progress. I remember when the Metallica purists freaked out about their new haircuts. Good show getting a vote for the RRHOF, Eddie. Hard Rock/Metal has an influential voice and informed vote inside the walled city of the elites now. No sleep till…Scorpions! Seriously- I listened to Stern for almost 2 decades, and he is so awful now. He became someone, that he would rallied against in his younger days. Now he has the model wife, the Hamptons house, hanging with A-listers. Don’t ever become that guy Eddie. Congrats on getting on the HOF Voting Committee. Maybe you can rally for Maiden & Priest to get recognized as the greats they are. Plus maybe, Journey, Bon Jovi, J Geils, Boston, Bad Company, Foreigner, Thin Lizzy, Ozzy, and of course UFO. Eddie’s on the inside of the RNRHOF now. Strange World. Two groups you rarely hear about when there’s talk of Rock and Roll Hall of Fame snubs are Grand Funk Railroad and Blue Oyster Cult. GFR sold out Shea Stadium faster than The Beatles, and were such a good live band that Peter Grant had their power shut off when they were busy blowing Led Zeppelin off the stage. BOC’s first 5 albums are stellar, and they also had two really good Martin Birch produced ones in the early 1980s. They are so much more than that band with the cowbell. Good luck with TMS. I’m keeping my fingers crossed.